Personna is a company which is founded in the year 1875. It is the first company which launched a safety razor in the USA and has been a leader in inventing and manufacturing of wet shaving accessories. Actually Personna is America’s choice No. 1 in blades and razors because of highest quality cutting edges. Personna has a subsidiary company which is called Toolworx and which exists almost decade. Toolworx is offering hair, skin and nail care implements to beauty professionals at affordable prices, including these texturizing scissors. 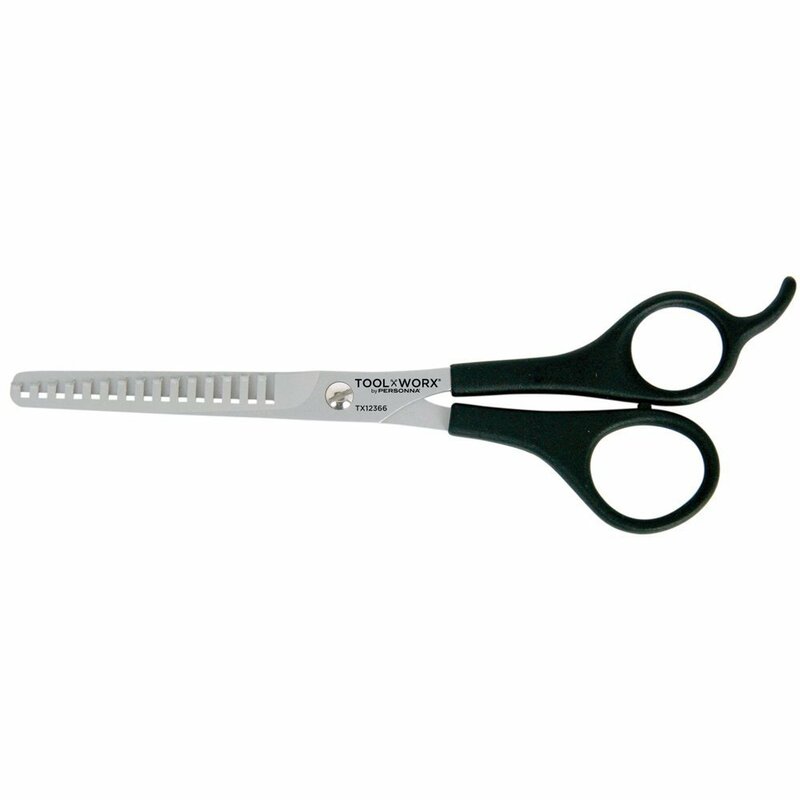 These Personna Toolworx hair shears are made of stainless steel, so they do not rust. As these scissors are intended for hair thinning, they have two kinds of blades – one blade is beveled edge hollow ground blade, but other blade has 14 micro-teeth. This Toolworx product is available in two different sizes – 6-1/2 inches and 6-3/4 inches, but their weight is 1.3 ounces. These hair thinning scissors have tension adjustment screw, therefore, every hairdresser can customize their tension according to its individual needs and wants. They do not have finger inserts for finger rings which usually improve fit and comfort, but they have non removable finger rest which relieves discomfort from hands and shoulders during hair cutting. It should be mentioned, that this Toolworx product does not come with any storage case, therefore, if you need it, you have to buy it separately. Considering that these hair shears are made of stainless steel, they are silver color, but their satin finish gives them matte sheen. They also have black plastic handle and golden tension adjustment screw. These Toolworx hair scissors can be used both by professional barbers and hairdressing students, but they are more suitable for amateurish use. As they have micro-teeth blade, they are meant for hair thinning or texturizing. Hair thinning means reducing of hair bulk, but hair texturizing means forming of certain texture. These Personna Toolworx TX12366 Texturizing Shears are made of stainless steel and have two kinds of blades – bevel edge blade and 14 micro-teeth blade. You can get these hair thinning scissors in two different lengths – 6-1/2” and 6-3/4”. Their design can be described as polished silver with satin finish, but they have other design elements as well, for example, golden tension adjustment screw and black plastic handle. As mentioned before, this product features adjustable tension screw and non removable finger rest, but it does not have finger inserts. It should be mentioned, that this Toolworx product does not come with any storage case. No matter whether you are experienced hairdresser or hairdressing amateur, you can thin or texturize the hair like real professional.